Imagine my DELIGHT at the appearance of this sign in the Melbourne legal district, a mere block from my office! 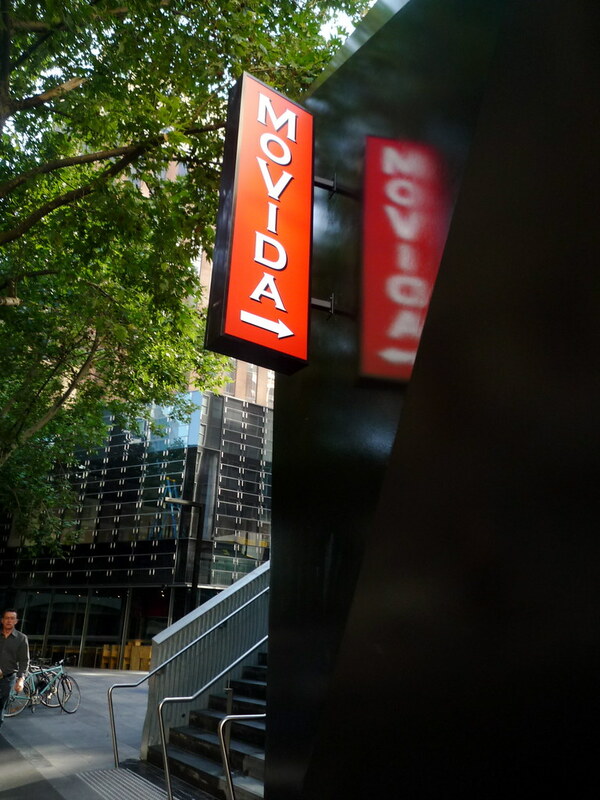 At the top of the flight of stairs at the back of the freshly facelifted NAB building are the two new MoVidas: the formal restaurant MoVida Aqui (which I haven't been to - YET) and the outdoor, no-bookings kiosk MoVida Terraza. 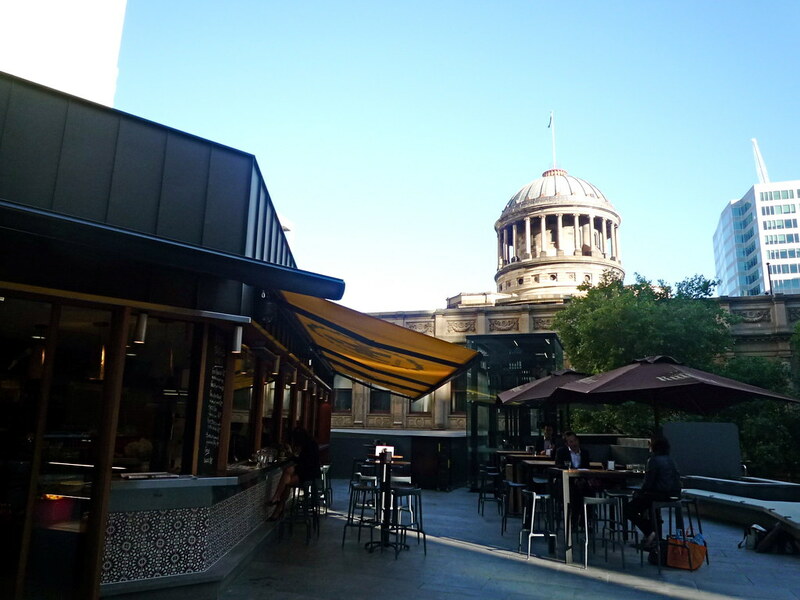 Both offer a great view of the Old High Court Building, and the dome of the Supreme Court library. I went to MoVida Terraza on Tuesday morning with housemate DJ and a group of friends for our fortnightly Bourgeois Breakfast. From Mondays to Saturdays, the Terraza does breakfasts from 7am, a small selection of lunch dishes from 11:30-3pm and then snacks from 3:30 until late. Miss F wanted tostada - house baked toast with queso de Burgos and honey ($6). 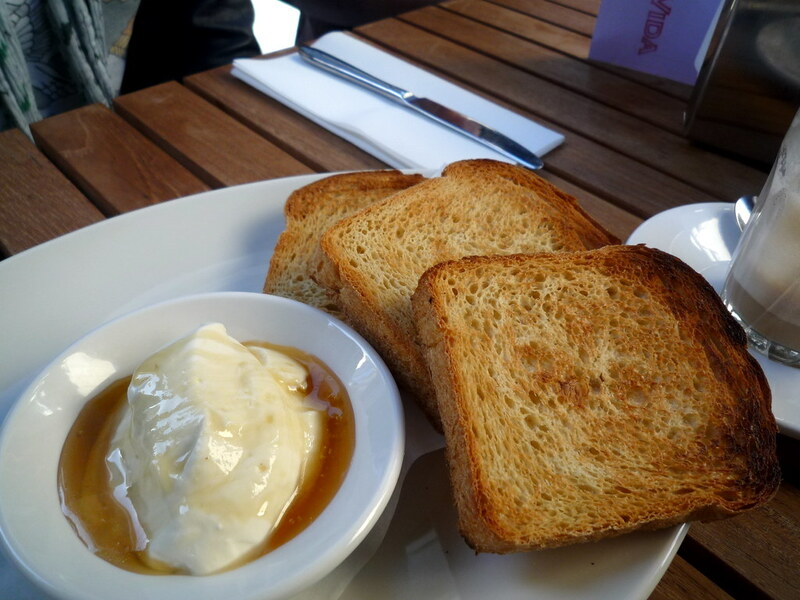 I had a taste of the cheese: it was amazingly soft and milky, and tasted great with the honey. 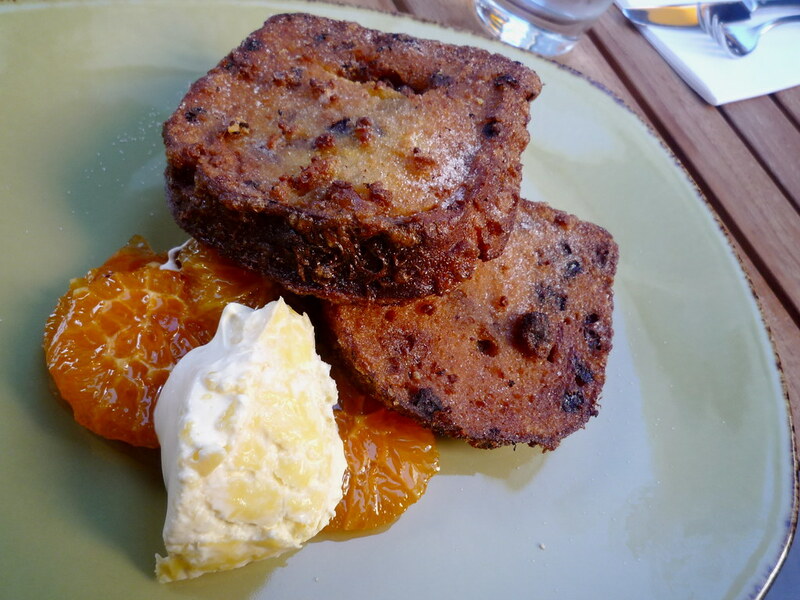 Housemate DJ and Miss A ordered the torrijas: orange and raisin French toast with poached fruit and clotted cream ($13). It looked divine, and gave DJ a complete sugar high. 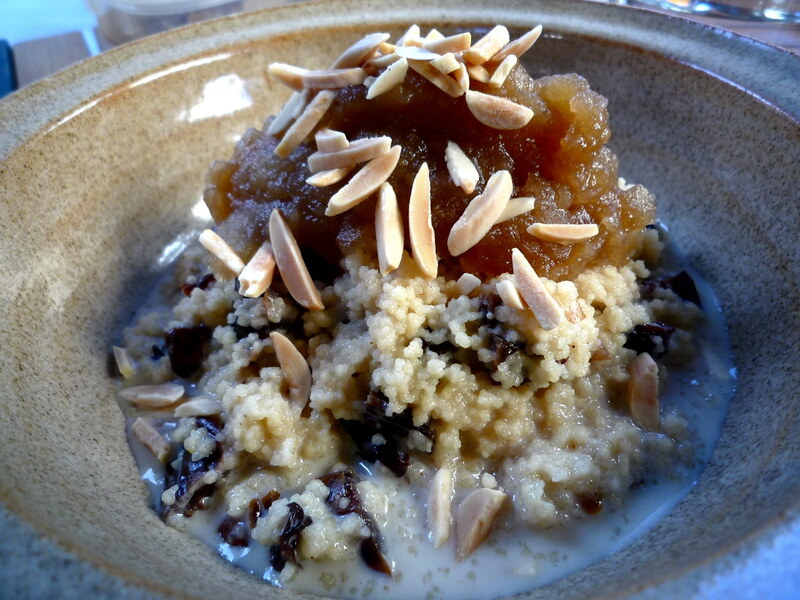 Ads ordered the cous cous ($11), an almost porridge-like bowl of honeyed cous cous with raisins, dates and slivered almonds. I tend to only have cous cous in savoury dishes, so was suitably intrigued. Miss C and I each ordered the tortillas: rather than the one with spinach ($10), we selected the one with jamón serrano and queso ($12). We chose.... wisely. It was completely delicious! 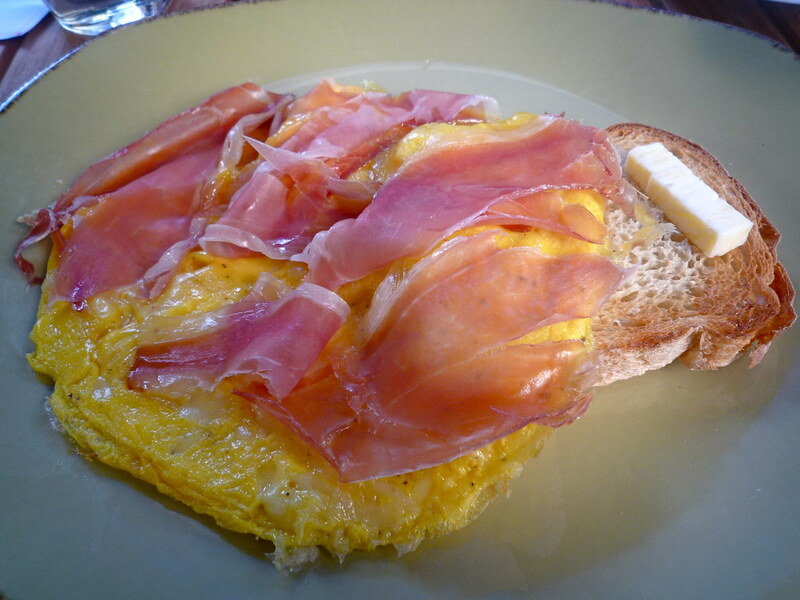 The cheese had lots of punch, and the uncooked jamón was lovely and soft. Oh, and DID I mention that the excellent coffees we drank were only $2.50 each?! Please, please keep them at this price, and I'll gladly start cheating on my two usual morning coffee cafes. 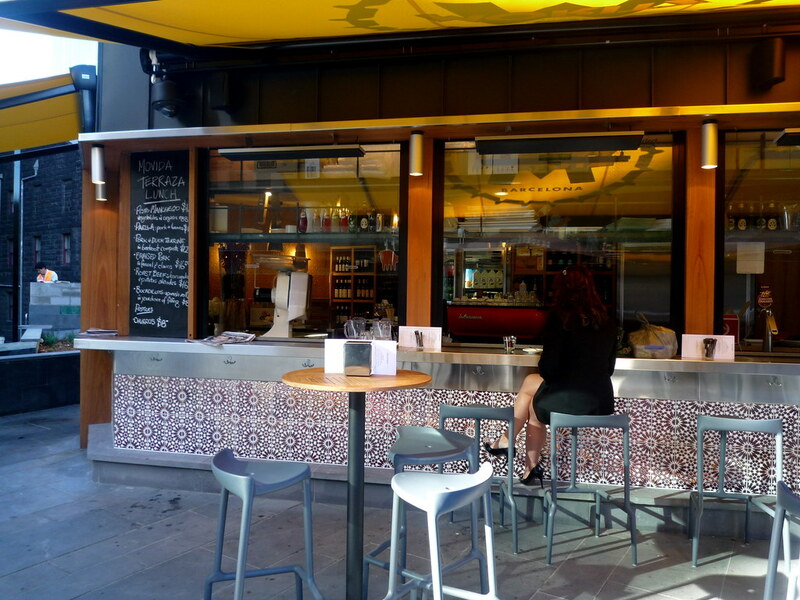 At the other end of the terrace sits MoVida Aqui. Um, if anyone wants to take me out to dinner this month, please make it MoVida Aqui. I had a stickybeak inside MoVida Aqui. At 8:30am the kitchen was a hive of activity - Mr MoVida himself Frank Camorra was there trimming duck breasts and chatting about lunch at Circa. 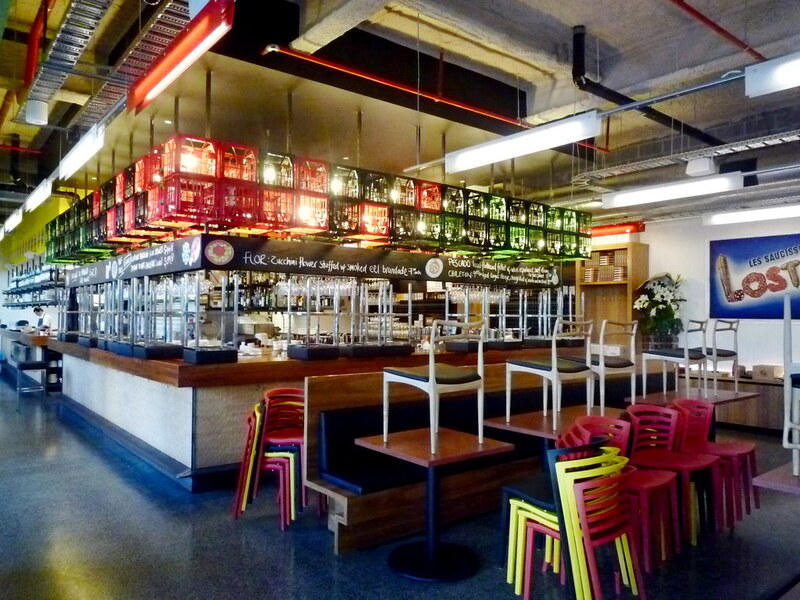 Love the very Melbourne-laneways use of plastic milk crates above the bar! We went to Aqui last night! I find the interior has a bit of a canteen-like atmosphere (not helped by the fact that the lighting, though nicely done, is all flouro energy savers) but the food and service is top notch! We had the most incredibly tender braised rabbit leg with big fat juicy raisins and honey, smooshy delicious beef cheek in Pedro Ximenez and anchovies with tomato sorbet, and chargrilled quail with chickpeas and morcilla and wagyu with cubes of horseradish custard and aaaarghhlgldrool..... I want to eat it all again! Hannah, the Terraza IS open for breakfast on Saturdays. Hie you hence! The Beirut end of town could certainly do with more good quality restaurants like MoVida. 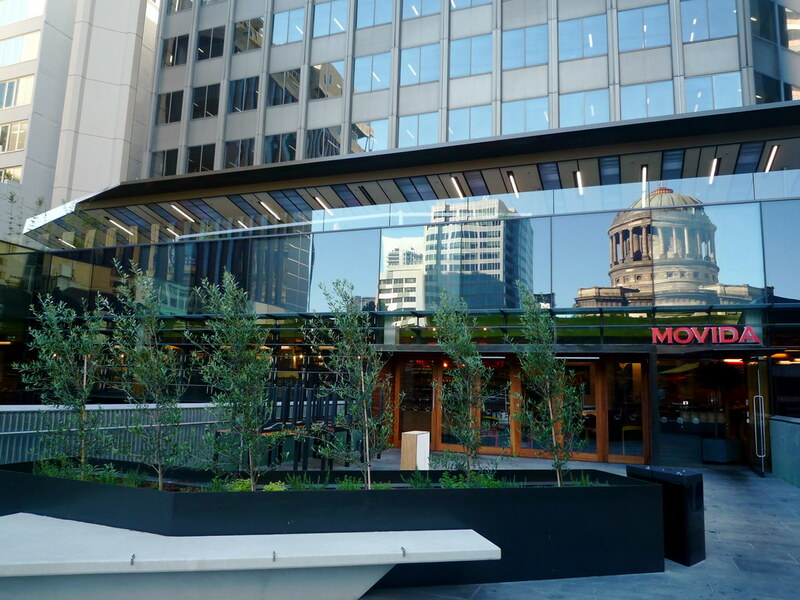 MoVida Aqui has been getting some raves from my friends, especially for lunch. Ok I am so there. Those breakfast dishes look amazing - really down for that french toast! oh goodness- that jamon does look fantastic.. I'm hungry and I only just had dinner! This looks like a VERY promising place to have a very different kind of breakfast! I checked out the menus on their website, can't wait to get my teeth into some seafood and saffron (!!) paella at Aqui - I wonder what the wait on bookings for Friday nights are like! The last time I tried to get Movida for a weekend night they needed three month's notice! mmm... I can do a sneaky breakfast before work! And can't go wrong with a $2.50 coffee and especially if it is decent. Ha, Joyce! I think they prefer to call it the "New York" end of the city rather than the "Beirut" end... tell 'em they're dreamin! Esz, GG, Vee, Penny: thanks! I went back for breakfast and enjoyed it just as much the second time.